For the song by the Lonely Island featuring Michael Bolton, see Jack Sparrow (song). Captain Jack Sparrow is a fictional character and the main protagonist in the Pirates of the Caribbean film series. The character was created by screenwriters Ted Elliott and Terry Rossio, and is portrayed by Johnny Depp, who based his characterization on Rolling Stones guitarist Keith Richards and cartoon character Pepé Le Pew. He first appears in the 2003 film Pirates of the Caribbean: The Curse of the Black Pearl. He later appears in the sequels Dead Man's Chest (2006), At World's End (2007), On Stranger Tides (2011), and Dead Men Tell No Tales (2017). In the films, Sparrow is one of the nine pirate lords in the Brethren Court, the Pirate Lords of the Seven Seas. He can be treacherous and survives mostly by using wit and negotiation rather than by force, opting to flee most dangerous situations and to fight only when necessary. Sparrow is introduced seeking to regain his ship, the Black Pearl, from his mutinous first mate, Hector Barbossa. Later he attempts to escape his blood debt to the legendary Davy Jones while battling the East India Trading Company. The character's role expanded as the films progressed. The Pirates of the Caribbean series was inspired by the Disney theme park ride of the same name, and when the ride was revamped in 2006, the character of Captain Jack Sparrow was added to it. He headlines the Legend of Captain Jack Sparrow attraction at Disney's Hollywood Studios, and is the subject of spin-off novels, including a children's book series Pirates of the Caribbean: Jack Sparrow, which chronicles his teenage years. Captain Jack Sparrow first appears in The Curse of the Black Pearl (2003) when he arrives in Port Royal in Jamaica to commandeer a ship. Despite rescuing Elizabeth Swann (Keira Knightley), the daughter of Governor Weatherby Swann (Jonathan Pryce), from drowning, he is jailed for piracy. That night, a cursed pirate ship called the Black Pearl attacks Port Royal and Elizabeth is kidnapped. The Black Pearl's captain, Hector Barbossa (Geoffrey Rush), desperately seeks one last gold coin to break an ancient Aztec curse that he and his crew are under. A blacksmith named Will Turner (Orlando Bloom) frees Sparrow to aid him in rescuing Elizabeth. They commandeer the HMS Interceptor and recruit a motley crew in Tortuga in Haiti before heading to Isla de Muerta, where Elizabeth is held captive. Along the way, Will learns that Sparrow was the Black Pearl's captain until Barbossa led a mutiny ten years earlier and took over the ship, marooning Sparrow on an island to die. Sparrow tells Turner that his father was a pirate known as "Bootstrap" Bill Turner. The rescue attempt goes awry and Barbossa maroons Jack and Elizabeth on the same island he had stranded Sparrow before. Elizabeth creates a signal fire from rum barrels and they are rescued by the British Royal Navy. Sparrow cuts a deal with Commodore James Norrington (Jack Davenport) to lead Norrington to the Black Pearl. Norrington refuses until Elizabeth, desperate to save Will, spontaneously accepts Norrington's earlier marriage proposal. Right before the film's climactic battle with the pirates at Isla de Muerta, Sparrow swipes a cursed coin from the treasure chest, making himself immortal and capable of dueling Barbossa. He shoots his rival with the pistol he has carried for ten years just as Will breaks the curse, killing Barbossa. Despite having assisted the Navy, Sparrow is sentenced to hang. At Sparrow's execution in Port Royal, Will saves Sparrow, but they are quickly captured. Elizabeth intervenes, declaring her love for Will who is pardoned, while Sparrow escapes by tumbling off a sea wall. The Black Pearl and her new crew arrive in time to retrieve him, and he becomes captain once more. Impressed by the wily pirate, Norrington allows him one day's head start before giving chase. A year following the events of the first film, Sparrow searches for the Dead Man's Chest, which contains the heart of Captain Davy Jones (Bill Nighy). Sparrow made a bargain with Jones to raise the sunken Black Pearl and make Sparrow captain for thirteen years. Now the debt is due, and Sparrow must either serve one hundred years aboard the Flying Dutchman, or be dragged to Davy Jones's Locker by the Kraken. If he can find the Dead Man's Chest Sparrow can free his soul and control Jones and the seas. Adding to Sparrow's woes, Lord Cutler Beckett (Tom Hollander) of the East India Trading Company has a personal score to settle with Sparrow. Beckett wants the chest and forces Will Turner to search for Sparrow and his magic compass. Turner locates Sparrow and his crew on Pelegosto, held captive by cannibals who intend to eat Sparrow. They escape, and voyage to Tia Dalma (later revealed to be the Goddess, Calypso, bound in human form as Dalma, and former lover of Jones). Dalma immediately sees destiny in Will, and provides Sparrow with a jar of dirt - Jones can only set foot on land once every 10 years, and since land is where Sparrow is safe, Dalma suggests with the dirt that he takes land with him. Sparrow strikes a new deal with Jones to deliver one hundred souls in exchange for his own. Jones agrees but keeps Turner as a "good faith payment". Sparrow is recruiting sailors in Tortuga when he encounters Elizabeth Swann and James Norrington, the latter having succumbed to alcohol. Sparrow convinces Elizabeth that Turner can be freed by using the magic compass to find the chest. The duo head for Isla Cruces and find Will, who escaped Jones's ship and has stolen the key to the Chest. Turner wants to stab Jones's heart and free his father from Jones's servitude, while Norrington plots to restore his career by delivering the heart to Beckett. Sparrow wants it to convince Jones to call off the Kraken. Norrington escapes with the heart amid a battle with Jones's crew, and Jones summons the Kraken. Realizing Sparrow is the target, Elizabeth traps him aboard the Black Pearl as the crew abandons the ship, and kisses him while she handcuffs him to the mast. Then, the monster devours Sparrow and drags the ship and his soul to Davy Jones's Locker. The surviving crew seeks refuge with Tia Dalma (Naomie Harris), a magic woman, who produces a captain she says can rescue Sparrow: it was her doing that brought Barbossa back to life. With Davy Jones's heart in his possession and the Flying Dutchman under his command, Cutler Beckett begins exterminating all pirates. To combat Beckett, the nine pirate lords of the Brethren Court convene at Shipwreck Cove. Only Jack Sparrow is missing, killed and sent to Davy Jones's Locker at the end of the previous film. Sparrow, as Pirate Lord of the Caribbean, must attend, as he did not bequeathe to a designated heir his "piece of eight", a pirate lord's marker. The collective "nine pieces of eight" are needed to free sea goddess Calypso to defeat Beckett. With Elizabeth Swann (Keira Knightley) and Will Turner, Barbossa leads Sparrow's crew to Davy Jones's Locker using stolen navigational charts from the pirate lord Sao Feng (Chow Yun-fat). After the crew locate him, Sparrow deciphers a clue on the charts allowing them to escape the Locker. At the Brethren Court, Elizabeth has succeeded Captain Sao Feng as a Pirate Lord and is elected "Pirate King" after Sparrow breaks a stalemate vote. Sparrow is briefly reunited with his father, Captain Teague (Keith Richards). During a parley with Beckett and Jones, Sparrow is traded for Turner, whom Jones and Beckett had captured. When Sparrow negotiates with Beckett in the extended version of the film, it is revealed that he once sailed the Black Pearl under Beckett's command, but deserted after refusing to carry slave cargo. The Black Pearl battles the Flying Dutchman during a maelstrom created by Calypso, during which Sparrow steals Jones's heart to become immortal. When Jones mortally wounds Turner, Sparrow instead chooses to save Turner by helping him stab the heart, which kills Jones and makes Turner the Dutchman's captain. Together, the Pearl and the Dutchman destroy Beckett's ship. At the end, Barbossa again commandeers the Pearl and Sao Feng's charts, stranding Sparrow and Gibbs in Tortuga. After failing to find the Fountain of Youth, Sparrow arrives in London only to learn someone is gathering a crew by using his name. While searching for the imposter, he saves Gibbs from being hanged but is captured by the Royal Guards. They present him to King George II. Sparrow is surprised to learn Captain Barbossa is now a privateer in the Royal Navy. Sparrow refuses to negotiate with them to locate the Fountain of Youth and escapes. Soon he crosses paths with his impersonator, an old flame named Angelica (Penélope Cruz). She shanghais him to serve aboard the Queen Anne's Revenge, the ship captained by her father Blackbeard (Ian McShane), who forces Sparrow to search for the Fountain of Youth. Sparrow fails in his attempt to take over the ship in a mutiny against Blackbeard and save the naive Angelica from her evil father. After encountering dangerous mermaids, Barbossa, and the Spanish Navy, Sparrow locates the Fountain of Youth. When Angelica is wounded, he tricks Blackbeard into sacrificing himself to save her, and Angelica blames Sparrow for her father's death. Sparrow and Angelica acknowledge their feelings for one another, but Sparrow maroons Angelica on an island, believing she may avenge her father's death. Gibbs, meanwhile, has retrieved the shrunken Black Pearl from Blackbeard's collection of shrunken ships in the hope of restoring it to normal size. Though he has forfeited his opportunity for immortality, Sparrow settles for being famous as the one who found the Fountain of Youth. Following the film's end credits, Angelica's voodoo doll of Sparrow has drifted to the island that she is marooned on. Sparrow will return in the fifth film, portrayed once again by Johnny Depp, coming May 26, 2017. When writing the screenplay for The Curse of the Black Pearl, Ted Elliott and Terry Rossio envisioned Captain Jack Sparrow as a supporting character in the vein of Bugs Bunny and Groucho Marx. The producers saw him as a young Burt Lancaster. Director Gore Verbinski admitted, "The first film was a movie, and then Jack was put into it almost. He doesn't have the obligations of the plot in the same ways that the other characters have. He meanders his way through, and he kind of affects everybody else." Sparrow represents an ethical pirate, with Captain Barbossa as his corrupt foil. His true motives usually remain masked, and whether he is honorable or evil depends on the audience's perspective. This acts as part of Will Turner's arc, in which Sparrow tells him a pirate can be a good man, like his father. Following the success of The Curse of the Black Pearl, the challenge to creating a sequel was, according to Verbinski, "You don't want just the Jack Sparrow movie. It's like having a garlic milkshake. He's the spice and you need a lot of straight men ... Let's not give them too much Jack. It's like too much dessert or too much of a good thing." Although Dead Man's Chest was written to propel the trilogy's plot, Sparrow's state-of-mind as he is pursued by Davy Jones becomes increasingly edgy, and the writers concocted the cannibal sequence to show that he was in danger whether on land or at sea. Sparrow is perplexed over his attraction to Elizabeth Swann, and attempts to justify it throughout the film. At World's End was meant to return it tonally to a character piece. Sparrow, in particular, is tinged with madness after extended solitary confinement in Davy Jones's Locker, and now desires immortality. Sparrow struggles with what it takes to be a moral person, after his honest streak caused his doom in the second film. This is mainly shown by his increasingly erratic behaviour and Jack's hallucinations which appeared to be simply his deranged mind in the beginning where dozens of "Jack Sparrows" appeared to crew the ship in his solitary exile, but later the hallucinations grew more important and there were mainly two "Jacks" constantly arguing about which path to follow: the immortality or the mortality. The last hallucination took place while Jack was imprisoned on the Dutchman where his honest streak won (possibly due to not liking his sea creature-like "future" which comedically dropped his brain and searched for it around the Brig). By the end of At World's End Sparrow is sailing to the Fountain of Youth, an early concept for the second film. Rossio said in 2007 that a fourth film was possible, and producer Jerry Bruckheimer expressed interest in a spin-off. Gore Verbinski concurred that "all of the stories set in motion by the first film have been resolved. If there ever were another Pirates of the Caribbean film, I would start fresh and focus on the further adventures of Captain Jack Sparrow." On Stranger Tides was first announced on September 28, 2008, during a Disney event at the Kodak Theater. Verbinski did not return to direct the fourth installment and was replaced by Rob Marshall. The movie uses elements from Tim Powers' novel of the same name, particularly Blackbeard and the Fountain of Youth, but the film is not a straight adaptation of the novel. Looking to do a family film, Johnny Depp visited the Walt Disney Studios in 2001 when he heard of plans to adapt the Pirates of the Caribbean ride into a film. Depp was excited by the possibility of reviving an old Hollywood genre, and found the script met his quirky sensibilities: the crew of the Black Pearl were not in search of treasure but trying to return it to lift a curse on them, and the traditional mutiny had already occurred. Depp was cast on June 10, 2002. Producer Jerry Bruckheimer felt Depp would give the film an edge that could draw teenage and adult audiences despite Disney's reputation for soft children's fare. At the first read-through, Depp surprised the cast and crew by portraying the character in an off-kilter manner. He researched 18th-century pirates and, seeing parallels with modern rock stars, modeled his performance on Keith Richards. Richards later appeared in two cameos as Jack's father, Captain Teague, in At World's End and On Stranger Tides. Verbinski and Bruckheimer had confidence in Depp, partly because Orlando Bloom would play the traditional Errol Flynn-type character. Depp improvised the film's final line, "Now, bring me that horizon", which the writer called his favorite line. Disney executives were initially confused by Depp's performance, questioning whether the character was drunk or gay. While watching the rushes, Disney CEO Michael Eisner proclaimed Depp was ruining the film. Depp's response to Disney executives was they could trust him with his choices or let him go. Many industry insiders questioned Depp's casting, as he was an unconventional actor not known for working within the traditional studio system. Depp's performance won acclaim from film critics. Alan Morrison found it "Gloriously over-the-top ... In terms of physical precision and verbal delivery, it's a master-class in comedy acting." Roger Ebert praised Depp for drawing away from the character as written and found Depp's performance "original in its every atom. There has never been a pirate, or for that matter a human being, like this in any other movie ... his behavior shows a lifetime of rehearsal". Depp won a Screen Actor's Guild award for his performance, and was nominated for a Golden Globe and the Academy Award for Best Actor, the first in his career. Film School Rejects argued the film made Depp as much a movie star as he was a character actor. Depp's return in Dead Man's Chest was the first time he had ever made a sequel. Drew McWeeny wrote, "Remember how cool Han Solo was in Star Wars the first time you saw it? And then remember how much cooler he seemed when Empire came out? This is that big a jump." Depp received an MTV Movie Award and a Teen Choice Award for Dead Man's Chest, and was nominated for an Empire Award and another Golden Globe. For his performance in At World's End, Depp won an MTV Movie Award for Best Comedic Performance, as well as a People's Choice Award, a Kids' Choice Award, and another Teen Choice Award. He has signed on to reprise the role for future sequels. Depp wears a dreadlock wig in a rock-and-roll approach to a pirate aesthetic. He wears a red bandanna and numerous objects in his hair, influenced by Keith Richards' habit of collecting souvenirs from his travels; Sparrow's decorations include his "piece of eight". Sparrow wears kohl around his eyes, which was inspired by Depp's study of nomads, whom he compared to pirates, and he wore contacts that acted as sunglasses. Sparrow has several gold teeth, two of which belong to Depp, although they were applied during filming. Depp initially forgot to have them removed after shooting The Curse of the Black Pearl, and wore them throughout the shooting of the sequels. Like all aspects of Depp's performance, Disney initially expressed great concern over Depp's teeth. Sparrow wears his goatee in two braids. 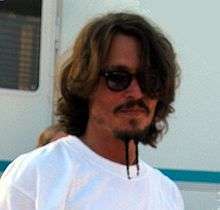 Initially wire was used in them, but the wires were abandoned because they made the braids stick up when Depp lay down. Sparrow has numerous tattoos, and has been branded a pirate on his right arm by Cutler Beckett, underneath a tattoo of a sparrow. Depp collaborated with costume designer Penny Rose on his character's appearance, handpicking a tricorne as Sparrow's signature leather hat; to make Sparrow's unique, the other characters did not wear leather hats. A rubber version was used for the scene in Dead Man's Chest when the hat floats on water. Depp liked to stick to one costume, wearing one lightweight silk tweed frock coat throughout the series, and he had to be coaxed out of wearing his boots for a version without a sole or heel in beach scenes. The official line is that none of the costumes from The Curse of the Black Pearl survived, which allowed the opportunity to create tougher linen shirts for stunts. However, one remains which has been displayed in an exhibition of screen costumes in Worcester, England. It was a nightmare for Rose to track down the same makers of Sparrow's sash in Turkey. Rose did not want to silkscreen it, as the homewoven piece had the correct worn feel. Sparrow wears an additional belt in the sequels, because Depp liked a new buckle which did not fit with the original piece. Sparrow's weapons are genuine 18th century pieces: his sword dates to the 1740s and his pistol is from the 1760s. Both were made in London. Depp used two pistols on set, one of rubber. Both survived production of the first film. Sparrow's magic compass also survived into the sequels, though director Gore Verbinski had a red arrow added to the dial as it became a more prominent prop. As it does not act like a normal compass, a magnet was used to make it spin. Sparrow wears four rings, two of which belong to Depp. Depp bought the green ring in 1989 and the gold ring is a replica of a 2400-year-old ring Depp gave to the crew, though the original was later stolen. The other two are props to which Depp gave backstories: the gold-and-black ring is stolen from a Spanish widow Sparrow seduced and the green dragon ring recalls his adventures in the Far East. Among Depp's additional ideas was the necklace made of human toes that Sparrow wears as the Pelegosto prepare to eat him, and the sceptre was based on one a friend of Depp's owned. During the course of the trilogy, Sparrow undergoes physical transformations. In The Curse of the Black Pearl, Sparrow curses himself to battle the undead Barbossa. Like all the actors playing the Black Pearl crew, Depp had to shoot scenes in costume as a reference for the animators, and his shots as a skeleton were shot again without him. Depp reprised the scene again on a motion capture stage. In At World's End, Sparrow hallucinates a version of himself as a member of Davy Jones's crew, adhered to a wall and encrusted with barnacles. Verbinski oversaw that the design retained Sparrow's distinctive look, and rejected initial designs which portrayed him as over 100 years old. According to screenwriters Ted Elliott and Terry Rossio, Sparrow is a trickster who uses wit and deceit to attain his goals, preferring to end disputes verbally instead of by force. He walks with a slightly drunken swagger and has slurred speech and flailing hand gestures. Sparrow is shrewd, calculating, and eccentric. He fools Norrington and his crew to set sail on the royal ship Interceptor, which compels the admiration of Lieutenant Groves as he concedes: "That's got to be the best pirate I have ever seen". Norrington himself acquiesces to this praise: "So it would seem", in sharp contrast to what he had previously proclaimed: "You are without doubt the worst pirate I have ever heard of". In the third film, while he leaves Beckett's ship stranded and makes off, Lieutenant Groves asks him: "Do you think he plans it all out, or just makes it up as he goes along?" Though a skilled swordsman, Sparrow prefers to use his superior intelligence during combat, exploiting his environment to turn the tables on his foes, reasoning "Why fight when you can negotiate?" He uses strategies of non-violent negotiation and turning his enemies against each other. He invokes parleys and tempts his enemies away from their murderous intentions, encouraging them to see the bigger picture, as he does when he persuades Barbossa to delay returning to mortal form so he can battle the Royal Navy. He often uses complex wordplay and vocabulary to confound his enemies, and it is suggested that his pacifism may be one reason Barbossa and the crew of the Black Pearl mutinied. "Gentlemen, m'lady, you will always remember this as the day that you almost caught Captain Jack Sparrow." The character is portrayed as having created, or at least contributed to, his own reputation. When Gibbs tells Will that Sparrow escaped from a desert island by strapping two sea turtles together, Sparrow embellishes the story by claiming the rope was made from hair from his own back, while in reality, Sparrow escaped the island by bartering with rum traders. The video game Pirates of the Caribbean: The Legend of Jack Sparrow bases itself on these tall tales, including the sacking of Nassau port without firing a shot. Depp has likened pirates to rock stars in that their fame preceded them. Sparrow insists on being addressed as "Captain" and often gives the farewell, "This is the day you will always remember as the day that you almost caught Captain Jack Sparrow!" which is sometimes humorously cut off. When Norrington accuses him of being the worst pirate he has ever heard of, Sparrow replies, "But you have heard of me." In a deleted scene from The Curse of the Black Pearl Sparrow ponders being "the immortal Captain Jack Sparrow", and during At World's End he again is interested in immortality, although his father, Captain Teague, warns it can be a terrible curse. Sparrow ponders being "Captain Jack Sparrow, the last pirate," as the East India Trading Company purges piracy. Despite his many heroics, Sparrow is a pirate and a morally ambiguous character. When agreeing to trade 100 souls, including Will, to Davy Jones in exchange for his freedom, Jones asks Sparrow whether he can, "condemn an innocent man—a friend—to a lifetime of servitude in your name while you roam free?" After a hesitation Sparrow merrily replies, "Yep! I'm good with it!" He carelessly runs up debts with Anamaria, Davy Jones, and the other pirate lords. Sao Feng, pirate lord of Singapore, is particularly hateful towards him. In a cowardly moment, Sparrow abandons his crew during the Kraken's attack, but underlying loyalty and morality compel him to return and save them. Sparrow claims to be a man of his word, and expresses surprise that people doubt his truthfulness; there is no murder on his criminal record. Depp partly based the character on Pepé Le Pew, a womanizing skunk from Looney Tunes. Sparrow claims to have a "tremendous intuitive sense of the female creature," although his conquests are often left with a sour memory of him. Former flames, Scarlett and Giselle, usually slap him or anyone looking for him. His witty charm easily attracts women, and even has Elizabeth questioning her feelings. Verbinski noted phallic connotations in Sparrow's relationship with his vessel, as he grips the ship's wheel. The Black Pearl is described as "the only ship which can outrun the Flying Dutchman". The Freudian overtones continue in the third film when Sparrow and Barbossa battle for captaincy of the Black Pearl, showing off the length of their telescopes, and in a deleted scene, they fight over the steering wheel. Sparrow claims his "first and only love is the sea," and describes his ship as representing freedom. Davy Jones's Locker is represented as a desert, symbolizing his personal hell. When Dead Man's Chest grossed over $1 billion worldwide, Ian Nathan attributed this to Sparrow's popularity: "Pirates, the franchise, only had to turn up. There was a powerful holdover from the cheeky delights of its debut, something we hadn't felt since the Clone Wars called it a day." Empire in 2006 declared Depp's performance the seventy-fourth "thing that rocked our world" and later named him the eighth greatest movie character of all time. In 2015, a new poll of the 100 greatest film characters of all time placed him as the fourteenth greatest. A survey of more than 3,000 people showed Jack Sparrow was the most popular Halloween costume of 2006, and a 2007 poll held by the Internet Movie Database showed Sparrow to be the second most popular live action hero after Indiana Jones. In a 2007 Pearl & Dean poll, Jack Sparrow was listed as Depp's most popular performance. Todd Gilchrist feels Sparrow is the only element of the films that will remain timeless. According to Sharon Eberson, the character's popularity can be attributed to his being a "scoundrel whose occasional bouts of conscience allow viewers to go with the flaws because, as played to the larger-than-life hilt by Depp, he owns every scene he is in". Film history professor Jonathan Kuntz attributed Sparrow's popularity to the increased questioning of masculinity in the 21st century, and Sparrow's personality contrasts with action-adventure heroes in cinema. Leonard Maltin concurs that Sparrow has a carefree attitude and does not take himself seriously. Mark Fox noted Sparrow is an escapist fantasy figure for women, free from much of the responsibility of most heroes. Sparrow is listed by IGN as one of their ten favorite film outlaws, as he "lives for himself and the freedom to do whatever it is that he damn well pleases. Precious few film characters have epitomized what makes the outlaw such a romantic figure for audiences as Captain Jack Sparrow has." Entertainment Weekly put it on its end-of-the-decade, "best-of" list, saying, "Part Keith Richards rift, part sozzled lounge lizard, Johnny Depp's swizzleshtick pirate was definitely one of the most dazzling characters of the decade." In June 2010, Sparrow was named one of Entertainment Weekly's 100 Greatest Characters of the Last 20 Years. Jack Sparrow also appears in video games and books spun off the Pirates of the Caribbean media franchise, among them Kingdom Hearts II, where he is voiced by James Arnold Taylor. Pirates of the Caribbean: The Complete Visual Guide gives a backstory to Sparrow in which he was born on a pirate ship during a typhoon in the Indian Ocean and was trained to fence by an Italian. Books following Sparrow's adventures before the events of the film include a twelve-book series focusing on his teenage years entitled Pirates of the Caribbean: Jack Sparrow, and a five-books Pirates of the Caribbean: Legends of the Brethren Court series. In 2011, Ann C. Crispin wrote a novel titled Pirates of the Caribbean: The Price of Freedom, which follows Jack's adventures as a merchant captain for the East India Trading Company. In 2011, comedy group the Lonely Island, in collaboration with ballad singer Michael Bolton, released a song named for Jack. 1 2 "Port Royal". Pirates of the Caribbean: At World's End Official Website. Retrieved May 31, 2007. 1 2 3 4 5 6 7 8 9 10 11 12 13 14 15 16 17 Gore Verbinski (director) (2003). Pirates of the Caribbean: The Curse of the Black Pearl (Film). Walt Disney Pictures. 1 2 3 4 5 6 7 8 9 10 11 12 13 Gore Verbinski (director) (2006). Pirates of the Caribbean: Dead Man's Chest (Film). Walt Disney Pictures. 1 2 3 4 5 6 7 8 9 Gore Verbinski (director) (2007). Pirates of the Caribbean: At World's End (Film). Walt Disney Pictures. ↑ "Production Begins on "Pirates of the Caribbean: On Stranger Tides" in 3D" (Press release). Walt Disney Studios Motion Pictures. June 21, 2010. Retrieved June 21, 2010. ↑ Varma, Arjun (December 21, 2014). "Pirates of the Caribbean 5 Plot: Will Orlando Bloom and Keira Knightley reunite with Captain Jack Sparrow?". International Business Times. Retrieved December 21, 2014. 1 2 3 Ted Elliott, Terry Rossio, Stuart Beattie, Jay Wolpert (2003). Pirates of the Caribbean: The Curse of the Black Pearl: Audio Commentary (DVD). Buena Vista. 1 2 3 4 Sean Smith (June 26, 2006). "A Pirate's Life". Newsweek. Retrieved May 30, 2007. 1 2 Jeff Otto (June 28, 2006). "IGN Interviews Gore Verbinski". IGN. Retrieved May 31, 2007. ↑ "Shipload of Characters Both New and Familiar". Pirates of the Caribbean: Dead Man's Chest Production Notes. Retrieved May 31, 2007. 1 2 Ian Nathan (April 27, 2007). "Pirates 3". Empire. pp. 88–92. 1 2 3 Ted Elliott, Terry Rossio (2006). Pirates of the Caribbean: Dead Man's Chest: Audio Commentary (DVD). Buena Vista. ↑ "Characters (video)". Pirates of the Caribbean: At World's End Official site. Retrieved May 31, 2007. 1 2 "Success Can Be a Tough Taskmaster". Pirates of the Caribbean: At World's End Production Notes. Retrieved May 31, 2007. ↑ "Chapter 3 – Revealing the True Nature of all the Characters". Pirates of the Caribbean: At World's End Production Notes. Retrieved June 2, 2007. ↑ Charting the Return (DVD). Buena Vista. 2006. ↑ "Exclusive interview: Terry Rossio". Moviehole. February 12, 2007. Archived from the original on October 11, 2007. Retrieved February 12, 2007. ↑ "Bruckheimer talks Pirates spin-off". Moviehole. May 10, 2007. Archived from the original on May 12, 2007. ↑ Steve Fritz (November 30, 2007). "Talking Pirates with Gore Verbinski". Newsarama. Archived from the original on August 28, 2009. Retrieved December 2, 2007. ↑ "Johnny Depp (in Captain Jack Sparrow costume) surprises Disney D23 Expo audience". Los Angeles Times. September 11, 2009. Retrieved May 11, 2011. 1 2 3 Gore Verbinski, Johnny Depp (2003). Pirates of the Caribbean: The Curse of the Black Pearl Audio Commentary (DVD). Buena Vista. ↑ Greg Dean Schmitz. "Greg's Previews – Pirates of the Caribbean: The Curse of the Black Pearl (2003)". Yahoo!. Archived from the original on July 13, 2005. Retrieved August 9, 2008. 1 2 3 Stax (June 25, 2003). "Depp & Bruckheimer Talk Pirates". IGN. Retrieved May 31, 2007. 1 2 3 4 Ian Nathan (July 1, 2006). "Pirates of the Caribbean 2". Empire. pp. 66–69. ↑ Chris Nashawaty. "Box Office Buccaneer". Entertainment Weekly. Retrieved May 18, 2007. ↑ Alan Morrison. "Pirates Of The Caribbean: The Curse Of The Black Pearl". Empire. Retrieved May 21, 2007. ↑ Roger Ebert (July 9, 2003). "Pirates Of The Caribbean: The Curse Of The Black Pearl". Chicago Sun-Times. Retrieved May 21, 2007. ↑ "Pirates of the Caribbean: The Curse of the Black Pearl Awards". Allmovie. Retrieved May 31, 2007. ↑ "Pirates World's End: Johnny Depp's Farewell?". Emanuel Levy. 2007. Retrieved May 31, 2007. ↑ Neil Miller (May 29, 2007). "The Ten Most Powerful Movie Franchises in History". Film School Rejects. Retrieved May 31, 2007. ↑ Drew McWeeny (June 25, 2006). "Moriarty Reviews Pirates of the Caribbean 2: Dead Man's Chest!!". Ain't It Cool News. Retrieved May 29, 2007. ↑ MTV (June 4, 2007). "The MTV Movie Awards Winners!". Comingsoon.net. Retrieved June 4, 2007. ↑ "Awards for Pirates of the Caribbean: Dead Man's Chest (2006)". Internet Movie Database. Retrieved May 31, 2007. ↑ Marc Graser (September 24, 2008). "Disney, Depp return to 'Caribbean'". Variety. Retrieved September 25, 2008. ↑ Jack's Scarf And Wig (DVD). Buena Vista. 2006. ↑ Jack's Dingles (DVD). Buena Vista. 2006. ↑ Jack's Eye Make-Up (DVD). Buena Vista. 2006. 1 2 3 An Epic At Sea: The Making of Pirates of the Caribbean: The Curse of the Black Pearl (DVD). Buena Vista. 2003. ↑ Jack's Teeth/Johnny's Teeth (DVD). Buena Vista. 2006. ↑ "Depp's Golden Teeth". Internet Movie Database. June 23, 2003. Retrieved May 21, 2007. ↑ Jack's Beard (DVD). Buena Vista. 2006. ↑ Jack's Hat (DVD). Buena Vista. 2006. ↑ Jack's Pirate Coat (DVD). Buena Vista. 2006. ↑ Jack's Boots (DVD). Buena Vista. 2006. ↑ Jack's Shirt (DVD). Buena Vista. 2006. ↑ "Starstruck: the Costumes" (PDF). Retrieved August 4, 2010. ↑ Jack's Sash (DVD). Buena Vista. 2006. ↑ Jack's Belt (DVD). Buena Vista. 2006. ↑ Jack's Sword (DVD). Buena Vista. 2006. ↑ Jack's Pistol (DVD). Buena Vista. 2006. ↑ Jack's Compass (DVD). Buena Vista. 2006. ↑ Jack's Rings (DVD). Buena Vista. 2006. ↑ Jack's Cannibal Toe Necklace (DVD). Buena Vista. 2006. ↑ Jack's Cannibal Scepter (DVD). Buena Vista. 2006. ↑ Scott Collura, Eric Moro (May 29, 2007). "Designing At World's End". IGN. Retrieved June 2, 2007. ↑ Drew McWeeny (April 27, 2007). "AICN Exclusive! Pirates of the Caribbean 3 New Crew Member Designs!". Ain't It Cool News. Retrieved June 2, 2007. 1 2 "Pirates Dead Man's Chest: Depp's Iconic Role". Emanuel Levy. 2006. Retrieved May 31, 2007. ↑ The Immortal Captain Jack (DVD). Buena Vista. 2003. ↑ Gore Verbinski (2007). Two Captains, One Ship audio commentary (DVD). Buena Vista. ↑ Ian Nathan (October 27, 2006). "How Pirates' feckless hero won over the fans before he even showed up". Empire. p. 176. ↑ "200 things that rocked our world". Empire. January 2, 2006. p. 118. ↑ "100 Greatest Movie Characters". Empire. November 4, 2015. Retrieved April 1, 2016. ↑ "Captain Jack Sparrow top pick for 2006 Most Popular Halloween Costume". Extreme Halloween Network. October 17, 2006. Archived from the original on June 6, 2007. Retrieved June 2, 2007. ↑ "From this list of live-action heroes, who is your favorite?". Internet Movie Database. June 3, 2007. Retrieved June 3, 2007. ↑ "Johnny Depp's great Captain role". People. May 22, 2007. Retrieved June 4, 2007. ↑ Todd Gilchrist (May 24, 2007). "Pirates of the Caribbean: At World's End". IGN. Retrieved May 24, 2007. ↑ Sharon Eberson (May 24, 2007). "Jack Sparrow joins a unique line of iconic characters". Post Gazette. Retrieved June 2, 2007. ↑ Sandy Cohen (May 25, 2007). "Depp's Captain Jack Sparrow smashes enduring cinematic mold of swashbuckling seafarers". Associated Press. Archived from the original on July 30, 2010. Retrieved July 30, 2010. ↑ Mark Fox (May 24, 2007). "Besting Jack Sparrow". Crave Online. Retrieved June 4, 2007. ↑ "Top Ten Movie Outlaws". IGN. September 19, 2007. Retrieved September 22, 2007. ↑ Richard Platt; Glenn Dakin (2007). Pirates of the Caribbean: The Complete Visual Guide. Dorling Kindersley. pp. 12–15. ISBN 0-7566-2676-5. ↑ "Pirates of the Caribbean: Jack Sparrow series". Goodreads. Retrieved December 7, 2014. ↑ "Pirates of the Caribbean: Legends of the Brethren Court". Goodreads. Retrieved December 7, 2014. ↑ "Pirates of the Caribbean: The Price of Freedom". Goodreads. Retrieved December 7, 2014. ↑ Bierly, Mandi (May 9, 2011). "Michael Bolton returns to SNL after 20 years: Best thing he did in between appearances?". Entertainment Weekly (via archive.org). New York. Archived from the original on May 11, 2011. Retrieved June 8, 2015. 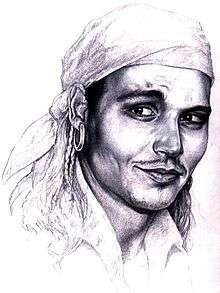 Wikimedia Commons has media related to Jack Sparrow.